Pigeon Forge in 3, 5, and 7 days. Opens in a new window. Nice place and great location. Close to the Island a good place to stay and shopping!! Location of the property is excellent. Though rooms are bit small. Bathrooms and closet has single sliding door and small. vanity needs upgrade. Staff was excellent. for EV or Tesla Owners there is near by property has the wall charger which is awesome. Also in 3 mile radius you will find 4 Tesla destination charging places which gives your vehicle ample of juice to hang around. Where to find Pigeon Forge hotels near an airport? Where can I find hotels in Pigeon Forge that are near tourist attractions? From the budget level to the more upmarket, Pigeon Forge offers an amazing range of quality hotel options. Spend some time checking out Expedia's 163 accommodation listings, which are all within a 0.1-kilometre (0.06-mile) radius of central Pigeon Forge. 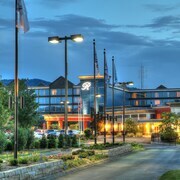 Finding a room close to the inner-city sights and action of Pigeon Forge is only a few mouse clicks away. Expedia's database lists the River Place Condos and Holiday Inn Pigeon Forge, which you'll find a short distance of Pigeon Forge's city center. Pigeon Forge is famous for the Dollywood. The RiverStone Resort & Spa and Smokies Bed and Breakfast are all nearby. Thrifty travelers can breathe easy. The Pigeon Forge area features loads of keenly priced hotels and accommodations. 1 kilometre (1 mile) away from Pigeon Forge's center is where you'll find the James Manor. 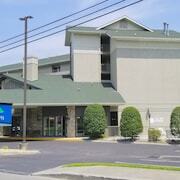 The La Quinta Inn & Suites Pigeon Forge is just 2 kilometres (1 mile) away. The Ramada Pigeon Forge North and the Quality Inn And Suites Dollywood are some more economical places that you could look into. You could check out the The Lodge at Buckberry Creek and the Wyndham Vacation Resorts Great Smokies Lodge. The The Lodge at Buckberry Creek is located 9 kilometres (6 miles) from the heart of Pigeon Forge. 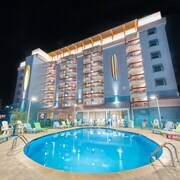 The Wyndham Vacation Resorts Great Smokies Lodge, is 11 kilometres (7 miles) away. 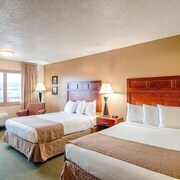 Another option is to book the Holiday Inn Club Vacations Smoky Mountain Resort or the Foxtrot Bed and Breakfast. The wider Eastern Tennessee area is definitely well worth visiting as well. Eastern Tennessee boasts mountains and rolling hills. Popular Eastern Tennessee visitor draws are historic mansions. Fun-loving visitors can also try their hand at mountain biking, hiking and zip-lining in this part of United States of America. 6 kilometres (4 miles) away from Pigeon Forge is Sevierville, where visitors can enjoy Tanger Outlets and Sevierville Golf Club. 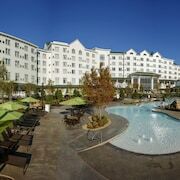 Sevierville hotel options include the Wyndham Smoky Mountains and Blue Mountain Mist Country Inn. Or stay in Gatlinburg, 10 kilometres (6 miles) to the southeast of Pigeon Forge, where you can pick from the Eight Gables Inn and Bluegreen Vacations Mountain Loft, Ascend Resort Collection. While visiting Gatlinburg, be sure to check out the Ripley's Aquarium of the Smokies and Rafting in the Smokies. For travelers arriving or departing via McGhee Tyson Airport, you might like to book a room at Hilton Knoxville Airport, or Courtyard Marriott Knox Airport, both of which are a short ride away. 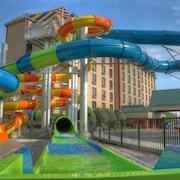 What are the most popular Pigeon Forge hotels? Are there hotels in other cities near Pigeon Forge? 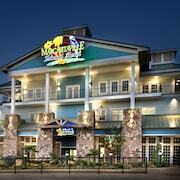 What other types of accommodations are available in Pigeon Forge? Explore Pigeon Forge with Expedia.ca’s Travel Guides to find the best flights, cars, holiday packages and more!